Window opening control devices have become a very important subject among window manufacturers and onward through to builders, contractors, and homeowners. 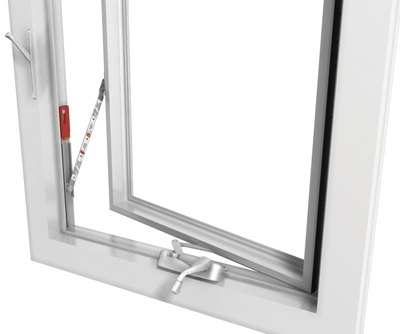 Being able to safely and securely operate a window which has safe guards in place to help control the windows opening so as to prevent accidental falls, while at the same time being able to be easily opened for egress purposes in case of an emergency, is critical in today's building projects. While components have been introduced previously for hung/sliding windows, it wasn't until now that a reliable engineered solution for the hinged window market has become available. Amesbury Truth™ new SafeGard™ Window Opening Control Device is that product. SafeGard is a reliable, easy to install and easy to operate solution which meet today's more stringent safety requirements such as ASTM F2090-10.